One year ago today I was on my way for a three week adventure that would change my life significantly. I traveled to Quito, Ecuador, the Galapagos Islands, Ecuador and all over Peru. I had no idea what an impact each of these places would have on me for the rest of my life. I arrived in the Galapagos Islands, embarking on an independent land-based tour to see the mystical, magical creatures that call this beautiful and unique place, home. I had struggles, adventures, laughs (many laughs), great food, fantastic photos, broken camera equipment and life affirming moments while I was there. All of this in just five days. It was truly amazing. 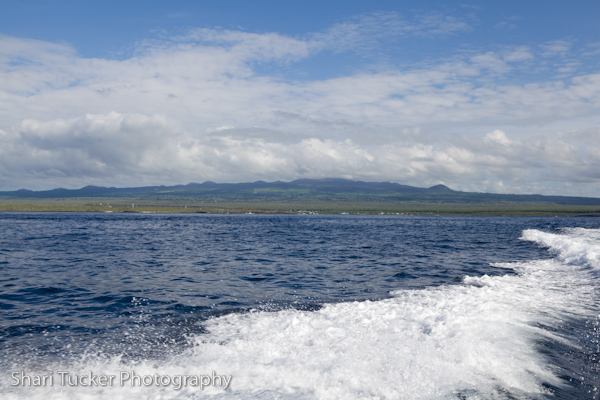 I dreamed of visiting the Galapagos Islands, but I never dreamed I would love it so much. Now, I dare you to dream. I will be hosting a free travel talk about the Galapagos islands on Wednesday, February 20th at The Adventure Travel Company – 5552 Kaye Street, Halifax, NS from 7 – 8pm. 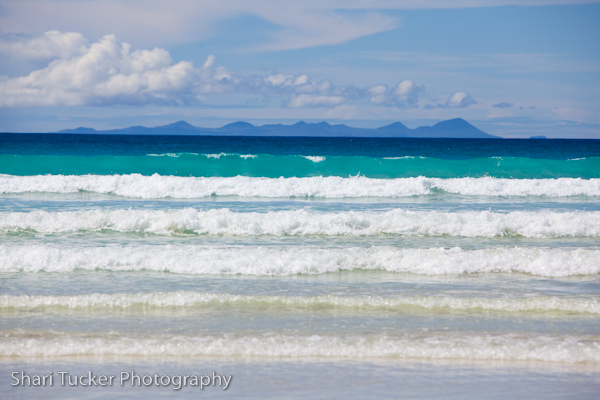 I invite you to join me while I take your imagination to the islands via beautiful photos, personal experiences and give you lots of information on how you can get there too! 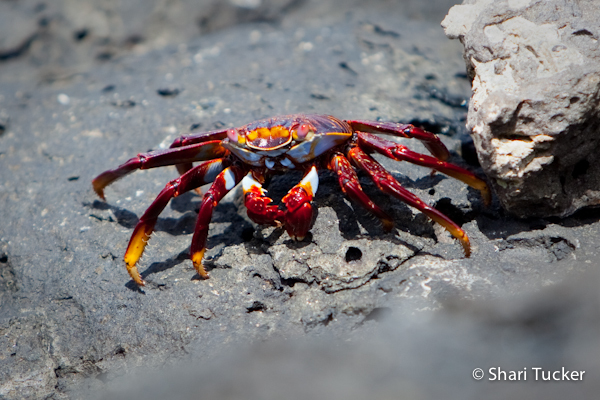 Please RSVP as space is limited and The Galapagos Islands is an in-demand destination! I was wandering along the waterfront one afternoon and came across the fresh fish market. I’m passionate about photographing people in their environment, working … what better place than a fresh fish market? The fisherman had come in off the boats not long before and they were preparing fresh fish for locals, on request. As with any subject, I started photographing from the front and then started to wander around to different vantage points. I’m so glad that I did because some of my favourite shots are the ones from behind the fish counter. Hope you enjoy my photo essay of the Fresh Fish Feast! Did you know that I Did THAT? When I sat down to start making a list of all of the fun, unique and adventurous things that I’ve done in travel since 2006, I was quite amazed at the list. Check it out! Visited Banos salt mines and the only sand dunes in the Caribbean. Puerto Plata Teleferico (cable car) – 2555 feet – the highest cable car and manicured gardens in the Caribbean. 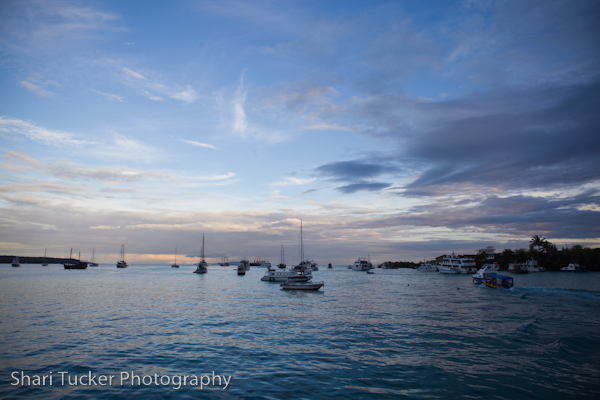 This photo was taken at sunset the evening before, but this is what I think Paradise looks like. I got up early my last day on Santa Cruz island. Finished packing and then headed to the docks to take a few last photos in the early morning sun. By 8am though it is already harsh and strong. I snapped a couple of photos of the bay and boats, waved to a few of the guides that I had traveled with in the past few days and headed back to my hotel for one last breakfast. My transfer driver came to pick me up at 9am and off we went for the 40-50 minute drive to the ferry to take us to Baltra Island where the airport is. The ferries are funny … They fit about 50 people, all crowded in on the lower level with all of our luggage stowed (not so safely) on the roof of the boat. Once I was on the ferry I saw a familiar face, but couldn’t quite place him. I noticed him tell the man collecting the .80c fee that mine was covered, so I figured the familiar face was there to take care of me. The ferry takes about 7-10 minutes. I honestly think it goes extra slow just so that staff have time to collect everyone’s fees. Once I got off, the familiar face was quick to help me with my luggage, show me where to stand and usher me into the shade. It was here that I asked his name … it was Darwin! The transfer driver who ate lunch with Mariana and I and who dropped us off at the Charles Darwin Station. How could I forget Darwin! Darwin continued to get my luggage on the bus to the airport, push his way through to bus line with me in tow. The bus was so packed that we both had to stand up on the 10 minute twisty turny bus ride to the airport. Darwin once again took care of my baggage and showed me where to go to check in. All of this without speaking any English. Check in went smoothly, he pointed me toward a small market to buy some souvenirs and showed me which line up to stand in to go through security. I gave him a hug and a small tip, said thank you and went on my way. Once through security I sat for nearly 2 hours, drenched in my own sweat even though I was sitting still. The heat is almost stifiling. There wasn’t a dry person in that airport, all of us with glistening arms, foreheads and wet spots on our backs. I ran into my friends Tanya and Victor who rescued me on my first day. I also chatted with Kate from one of my boat tours. Unfortunately none of that really seemed to help the time pass more quickly. It was like being in a sauna with a couple hundred people. Sound like fun? Thank goodness for the air conditioning once we got on the plane. And, it was a beautiful day for flying, so flights leaving Galapagos, flying into Guayaquil for our stop over and then into Quito were all beautiful. I got up really early on Wednesday morning (Feb 15) to head out to the tour I had booked the day before. Destination Floreana Island in search of penguins! Floreana is the shortest distance to travel to possibly see penguins. The other islands, Isabela, Santiago and Bartolome are all further either by land first and then boat, or just a longer boat ride. Being scared of getting sea sick, I decided to take the shortest route. By 8:15 we were on the boat … crammed on the boat I might say. There were 16 of us on the tour, which was capacity for this boat, Mitzzy Juli. Our official guide that day was Marco. He spoke some English, but not a lot. Enough to get by but not really enough for me to understand all of the history that he was explaining. As we headed out into the bay, one of the deck hands asked (and motioned) to see if I wanted to go somewhere. I thought that he was motioning to the small area inside, maybe because I had told Marco I was concerned about sea sickness. I said no because I’d much rather be in the fresh air than in an in-closed space. THEN as 2 or 3 other people headed to the edge of the boat and climbed up a ladder, I understood that he was asking if I wanted to go sit upstairs. Of course I wanted to sit upstairs! But, I had missed my chance. Upstairs was a small bench directly behind the captain of the boat, Raul. There was only room for 2-3 and now it was full. Boo me. So, I sat and enjoyed the shade and fresh breeze from the water, not to mention the spectacular views as we bounced our way out to sea. The waters are warm and calm this time of year. Now, it is still open ocean, but overall, mostly a mildly rocky ride. Nothing like my horrendous experience on the ferry from St. Pierre & Miquelon! The boat ride is about 1.5 hours. I couldn’t use my big camera on the boat as it makes me sea sick to look through it, so I took a few shots with my point and shoot. After we got going, like a lot of people, I think the boat lulled me to sleep. It wasn’t a very good sleep as my head was bouncing around, but a little siesta none-the-less. 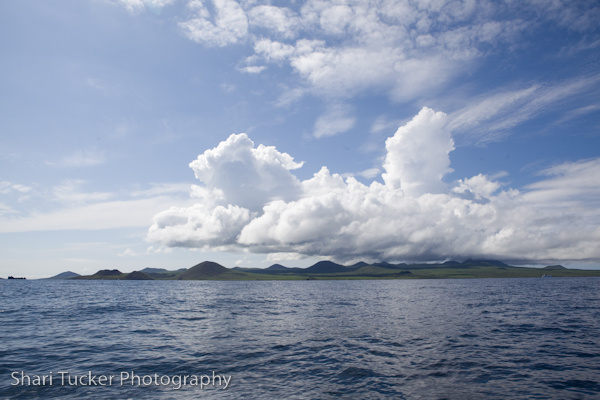 About 30 minutes from Floreana you could really begin to get a feel for the look and size of the island. It happens to also be the island that you see in the distance of this beautiful photo taken from Tortuga Bay. On arrival at Floreana our boat couldn’t go all the way in, so they tied it off to a floating thing a short distance from shore. 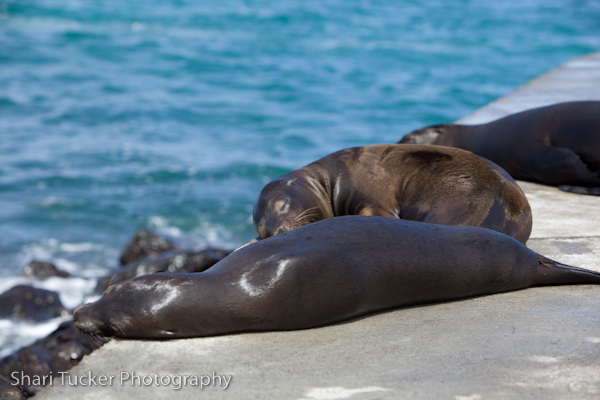 The floating thing also had three sea lions (lobo marino) basking in the hot hot hot sun. The Captain whistled loudly and a water taxi headed our way. 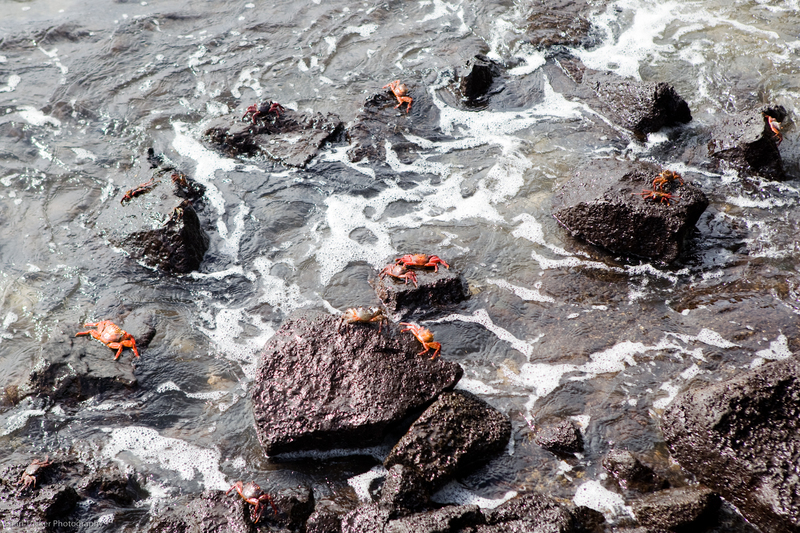 This is standard in Galapagos. There are water taxis everywhere and you (or your captain) just whistle loudly to get their attention then they’ll come get you. The water taxi pulled up along side our boat and we piled out single file. This is easy enough for me, but several passengers who were older or who had mobility issues had a really hard time transferring from one boat to the other. The waves would rock the boats … sometimes bringing them closer, sometimes separating them. No question it is dangerous, but I honestly doubt there are many accidents. The guides and deck hands are there to tell you when to step and hold your hand. Once at the dock, we climbed off the water taxi on to a stair case having the same issues as before with the boat rocking to and from the dock. I’ve done this quite a few times and I feel that I’m pretty aware overall, so it didn’t bother me, but a few people were really scared. We all got to land safely and headed out for our next little adventure … the highlands. After leaving the penguins behind, I stayed on the upper deck with Raul. I figured since the seas had gotten rougher that I would have a better chance at not being sick if I was in the fresh air, looking forward. After awhile, deck hand Richard came up and sat with us as well. I attempted conversation with the two of them, but it wasn’t the greatest as neither of them spoke English and my Spanish is still only in single words, not sentences. Of course, I was able to ask their names, as well as show them pictures from my trip so far on my Lumix Waterproof camera. Richard knew Armando (my snorkeling with the sea lions guy). We were able to chat briefly about a few things and they taught me a few new Spanish words. After about an hour, Raul all of a sudden said ‘Dolphins!’. Richard immediately grabbed my hand to get me to come with him. He took me down the steep ladder off the top of the boat and directly to the very front tip of the boat where he told me to sit with my feet over the edge. All of this through hand motions and Spanish. 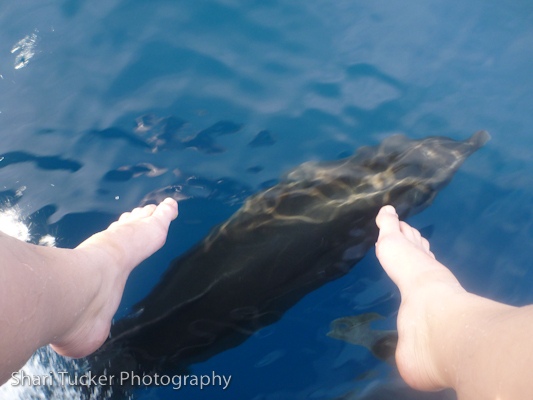 The next thing I knew there were three dolphins racing with the boat, DIRECTLY beneath my feet. My feet were about 2-3 feet from the water and the dolphins were less than a foot under the water. 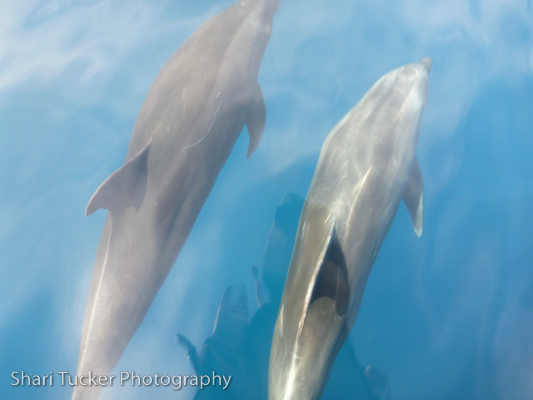 When Raul would slow the boat down, the dolphins would slow down … if he sped up as fast as he could go, the dolphins sped up right along with us. Besides the two or three that were swimming directly under the boat, there were half a dozen more doing tricks, jumping and doing displays in the water. 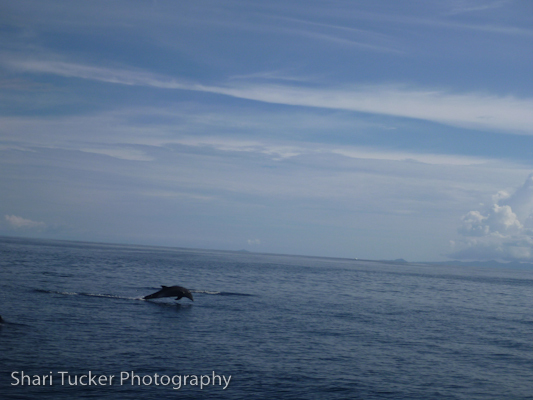 The next thing I knew, one of the dolphins came up for air, spraying me and completely covering me. Richard was lying down on the other side of the boat on his stomach and was getting sprayed in the face too. I’m sure he’s seen a display of dolphins like this a million times, but I think he enjoyed it a little extra that day because I was so excited. Up until this point I think I was strickly in awe of the beauty. Once I was covered in dolphin spray I shed one little tear. I was overwhelmed with the beauty around me. Overwhelmed and thankful for having this opportunity. And, believe it or not, I was glad that my camera was broken so that I didn’t have the urge to take it out and photograph this. Dolphins are very hard to photograph as they move so quickly and I would have wasted precious time trying to capture them instead of taking in the whole amazing scene. It was an absolutely beautiful moment meant just for me … no work, no worries, just pure beautiful enjoyment. It was at this time that I knew I was in love with the Galapagos Islands that no question, I would be returning. We must have stayed and ‘played’ with the dolphins for about 30 minutes and I enjoyed every single second. I don’t believe I’ve been this happy in a long long time. 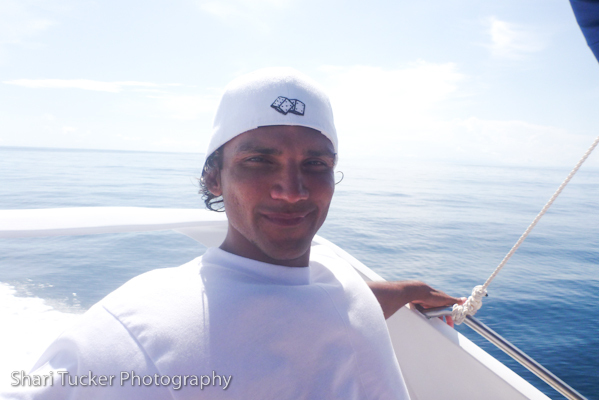 It is such a wonderful feeling to be in the open sea air and be so close to nature. Dolphins are so curious and playful. I really just wanted to jump in with them, but I didn’t think Captain Raul would let me do that! Although looking back, maybe I should have asked! I honestly can’t explain my feelings of that day other than feeling beauty rush through my body and a healthy energy rush through my veins. I feel like that one day simply changed my way of thinking. Somehow, weirdly and ‘hippy-like’ I felt connected to nature. It was a moment when I could feel all of my stress just leave my body and I felt completely rejuvenated. I’ve already done my little pitty party about being alone on Valentine’s day, but I tried to make the best of it. I headed out this evening around 5pm to the waterfront to shoot a few photos of the setting sun. Here, near the equator, the sun sets very quickly. It isn’t dusk for long in these parts at all. In fact, last night in the 15 minutes it took me to shower, the sun had already set and gone away completely so I missed it all together. Shame on me! Tonight I didn’t want to make the same mistake. I got a few nice shots, but nothing spectacular. For one, the sunset wasn’t ‘the best’ and two, I wasn’t really at an ideal location for viewing it. 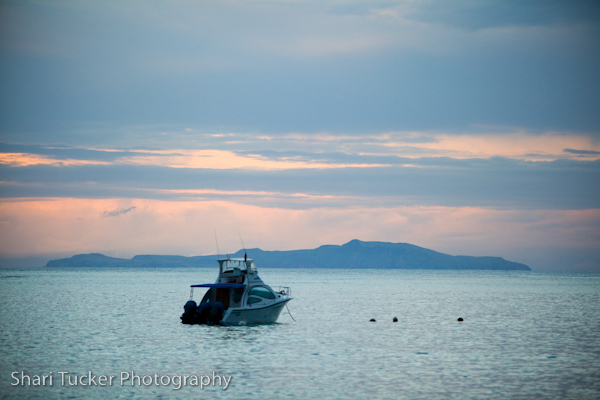 Tomorrow I think I’ll be coming back by boat around sunset time, so hopefully I’ll have another opportunity! Here’s a couple of quick photos though.